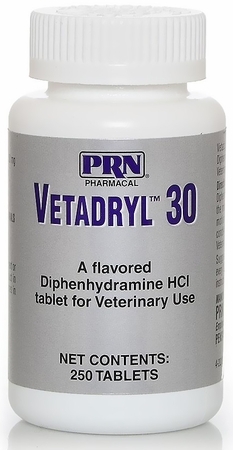 Vetadryl is an antihistamine recommended by veterinarians to treat a range of issues including allergies, motion sickness, travel anxiety – even insect bites that cause itching and pain. 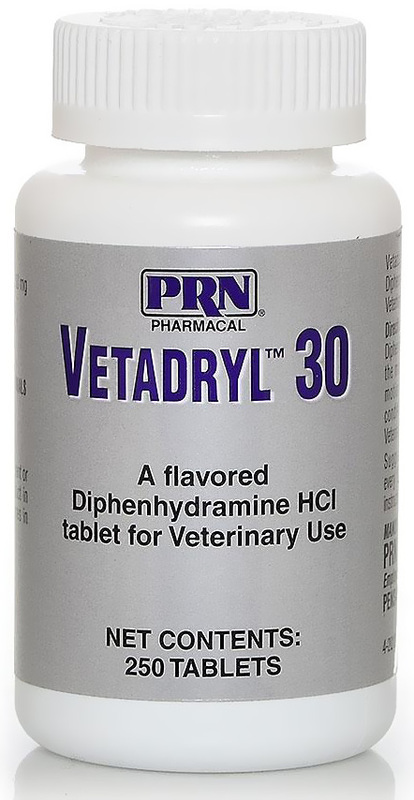 The active ingredient in Vetadryl is diphenhydramine. This chemical blocks the histamines that cause allergic reactions such as itching, watery eyes, runny noses and swelling. One side effect of the histamine blocking process is sleepiness, which is why this medication also works to calm pets and reduce motion sickness. Vetadryl is available in both 10mg and 30mg strengths for dogs and cats of all sizes, ensuring a greater likelihood for more accurate dosing. Vetadryl is less-expensive than branded over-the-counter diphenhydramine products at just pennies a tablet. View Vetadryl Drug Facts Sheet. What are VETORYL Capsules? VETORYL Capsules contain an adrenosuppressant drug that is used to treat hyperadrenocorticism in dogs. VETORYL Capsules are a prescription drug for dogs. Hyperadrenocorticism (also known as Cushing’s disease) is a condition in which excess levels of the hormone cortisol are produced. Cortisol is normally released from the adrenal gland into the bloodstream at times of stress. In dogs with hyperadrenocorticism, the level of cortisol produced is excessive and, if left untreated, becomes incapacitating. What should I talk to my veterinarian about before giving VETORYL Capsules? What are the possible side effects that may occur in my dog during therapy? VETORYL Capsules, like other drugs, may cause some side effects. Serious side effects have been reported in dogs taking VETORYL Capsules. Serious side effects can occur with or without warning and result in death. It is important to stop therapy and contact your veterinarian immediately if you think your dog has a medical problem or side effect from VETORYL Capsule therapy. If you have additional questions about possible side effects, talk to your veterinarian. As VETORYL Capsules control the hyperadrenocorticism, there should be a decrease in food and water consumption to normal levels. There should also be resolution of excess urination. If, however, there is a dramatic decrease in appetite or your dog stops drinking water, it could be an indication of a side effect requiring treatment. Response varies from dog to dog. Improvement can be seen in most dogs within a few weeks. Has kidney or liver disease. Takes certain medications. VETORYL Capsules should be used with caution with several medications used to treat heart disease (some diuretics and ACE inhibitors). VETORYL Capsules should be given according to your veterinarian’s instructions. Your veterinarian will tell you the number of VETORYL Capsules that is right for your dog. Do not open capsules and do not attempt to split or divide capsules. Do not handle the capsules if pregnant or trying to become pregnant. Studies in laboratory animals have produced birth defects and early pregnancy loss. In the event of accidental ingestion/overdose, seek medical advice immediately and take the labeled container with you. What do I do in case my dog takes more than the prescribed amount of VETORYL Capsules? Contact your veterinarian immediately if your dog takes more than the prescribed amount of VETORYL Capsules.